Measurement Top: 2.20 MTR | Bottom: 2.00 MTR| Dupatta: 2.00 MTR. A lot of white floral art work on a contrastingly dark background, either on the entire portion or sections of the shalwar kamiz, makes it Batik printing. A wave of fresh breeze, novel and catchy, Batik prints are eye-catching for their picturesque white designs on coloured canvas. Batik on salwar kamiz as an experiment has succeeded through inputs from countries like Indonesia and China. However our traditional stylists have over a period evolved a unique style of their own. 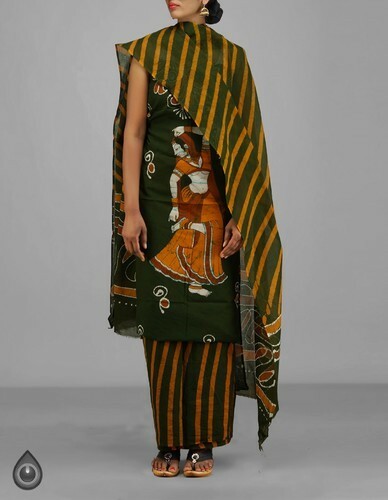 Established in the year 1980 at Hyderabad, Telangana, we “Unnati Silk Prints Private Limited” are engaged in the manufacturing, wholesaling and retailing a quality assortment of Cotton Saree, Silk Saree, Embroidered Dupatta, Check Saree and many more. These products are offered by us at competitive prices. Also, strict superiority checks are been approved by us over the entire assortment, to assure that our products are faultless and are in fulfillment with the norms defined by the industry.